The colour of this thong is gorgeous, and being a blue based red it can even be worn under white! A thong that combines both seduction and discretion. The rich Swiss embroidery decorates the front of the thong, while the back is more discreet. The lace effect elastic band along the waist sits gently on the skin without cutting in. 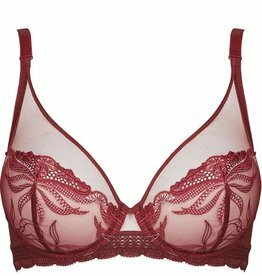 Looks amazing when worn with either of the matching bras - our favourite is the Plunge Bra which comes in a C to F cup. The Push Up Bra is a fabulous option for those wearing a B to D cup.